“With the melters assembled and all major process equipment already installed, our workforce remains on pace toward the construction complete contract milestone of June 2018 for the LAW Facility,” said Peggy McCullough, BNI project director for the WTP Project. For photos and more information about this significant accomplishment, visit http://bit.ly/2ygC02B. EDITOR'S NOTE: The following is an edited version of an article that appeared in the October 10, 2017, edition of the Department of Energy Office of Environmental Management's EM Update newsletter. 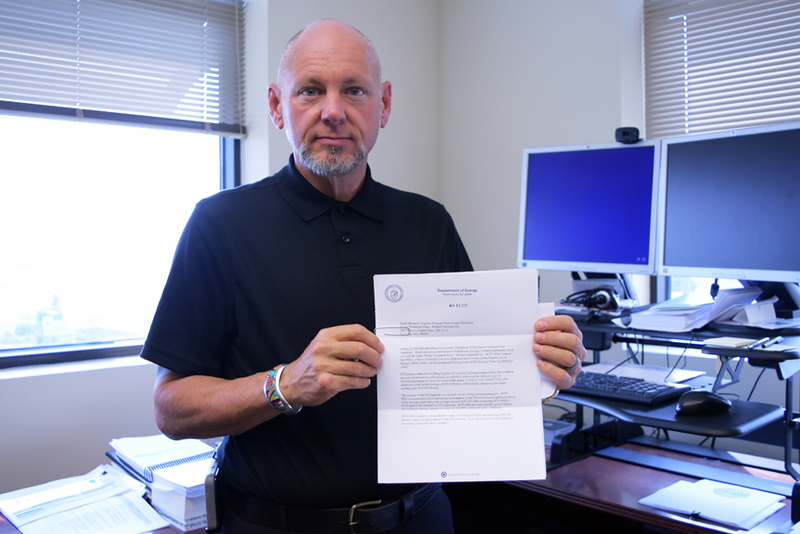 Frank Salaman, BNI manager of procurement and subcontracts for the Vit Plant, displays EM’s letter recognizing the company for its more than $7.8 million in federal cost savings. EDITOR'S NOTE: The following is an edited version of an article that appeared in the August 31, 2017, edition of the Department of Energy Office of Environmental Management's EM Update newsletter. 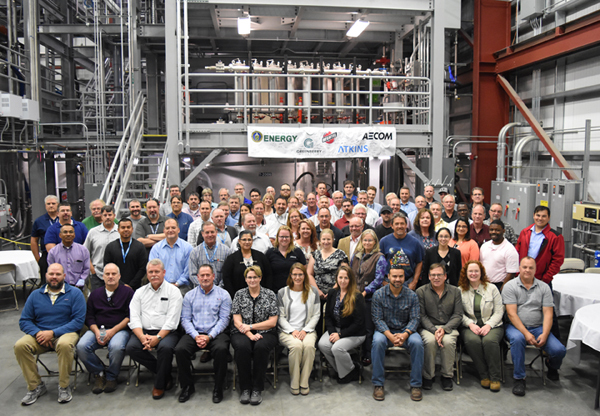 Bechtel National Inc. (BNI) and the Vit Plant were lauded by the Department of Energy Office of Environmental Management (EM) for achieving federal cost savings of more than $7.8 million in procurements and subcontracts in fiscal year 2016 (FY16). The Vit Plant's $7,841,000 savings exceeded its FY16 goal of $3.1 million by 152 percent. The savings resulted from BNI’s strategic negotiations with vendors and use of EM-sponsored eProcurement and eSourcing tools, which allow contractors to obtain bids from different suppliers via an online portal. It was the second consecutive year EM commended BNI for surpassing its SSI goal. WTP saved $3.4 million in fiscal year 2015. Ralph Holland, head of EM contracting activity, thanked the Vit Plant team for its commitment to EM’s Strategic Sourcing Initiative (SSI). BNI saved $7.1 million in the SSI, the second-highest FY16 total of all participating EM prime contractors. The SSI initiative applies an organized, systematic, and collaborative approach to acquire commonly used goods and services. It enables EM contractors to partner with companies to develop optimal solutions, share best practices, and create a strategic sourcing community. Vit Plant employees are often recognized as experts in their fields. Two radiological engineers are the latest to earn this designation after receiving awards from the Columbia Chapter of the Health Physics Society (CCHPS). 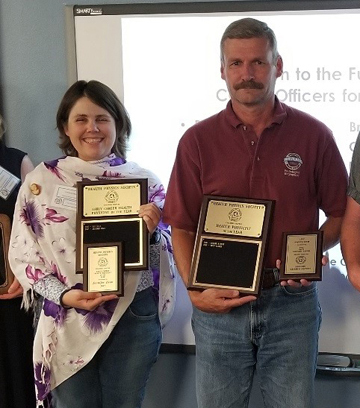 Jennifer Bean was honored as the Early Career Health Physicist of the Year, and Russ Lauber was voted Health Physicist of the Year at the annual CCHPS awards banquet this summer. CCHPS recognized Bean for her efforts to coordinate data collection, perform data analysis, and write the dose assessment report (DAR) for the Analytical Laboratory. 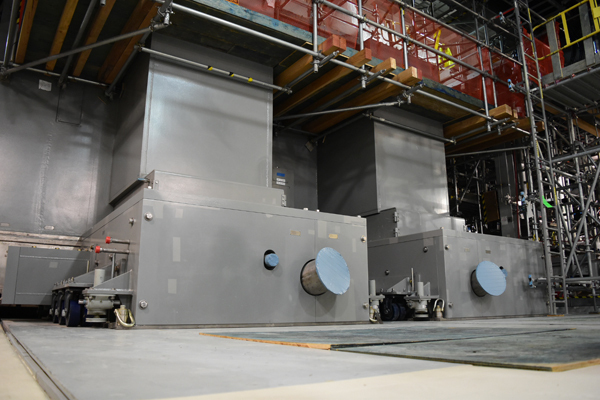 DARs are performed to ensure the facility design results in dose rates that meet requirements and are as low as reasonably achievable (ALARA) during operations. She also performed the shielding calculations to inform design of facility radiation shields. Lauber was also awarded for his work related to ALARA facility design. He implemented a checklist of all ALARA features needed to ensure safe operations at the Vit Plant. He also teaches discipline-specific ALARA training for all employees that need to implement ALARA into their primary tasks. He has written five Technical Basis documents and reports for use at the Vit Plant and is active in promoting professional development of early career employees. Per its website, the CCHPS is a professional organization whose members are specialists in radiation safety. These health physicists are dedicated to maximizing the beneficial use of radiation while minimizing the risk to people and the environment. 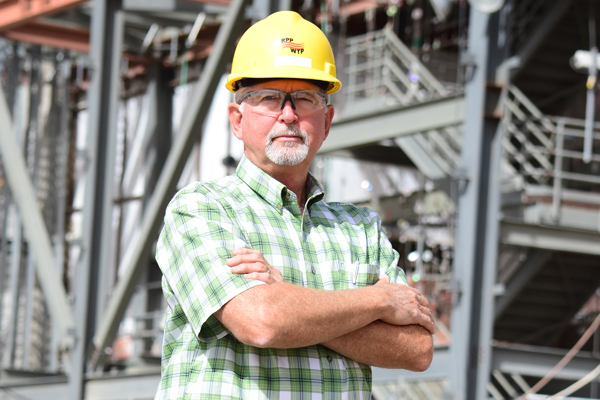 Joe has more than 40 years of experience in the construction industry and, of these, 35 years in nuclear construction. He has worked on ten nuclear power plants across the country, and he understands how and why safety and quality must be built into a plant. Joe now applies that knowledge to building the Vit Plant at Hanford. Joe joined the Vit Plant in 2002 and has worked on three of the four major nuclear facilities, as well as many of the support buildings. He has been in various construction supervision roles and seen hundreds of cubic yards of concrete placed, tons of steel erected, and permanent plant equipment installed. Joe also understands that engineering and construction, particularly on a mega project like the Vit Plant, is a team effort. "We have some of the best skilled craft and professionals working to get the job done right. We want to clean up Hanford and make our community a better place for our families. We want to make a difference." 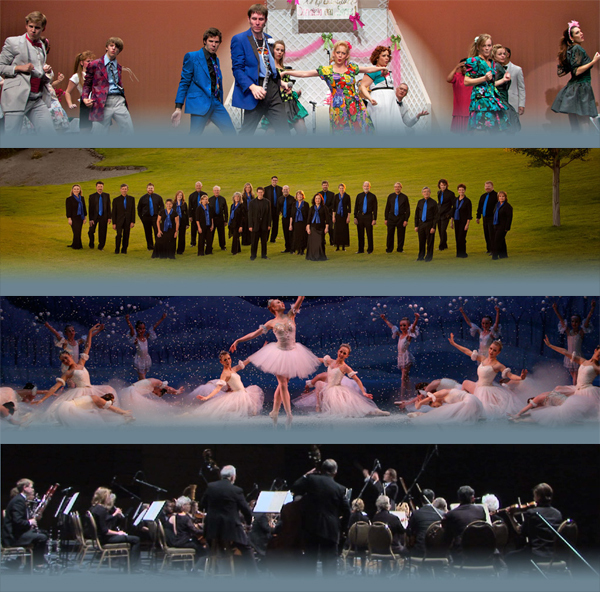 Read more about Bechtel's donation to build the 800-seat theatre at http://bit.ly/2yjveKY. Several Bechtel employees from the Vit Plant participated in a Trailwork Party at Badger Mountain sponsored by Friends of Badger Mountain and REI to celebrate National Public Lands Day. Employees in red stewardship shirts improved safety at the popular hiking spot by clearing, flattening, and widening trails. 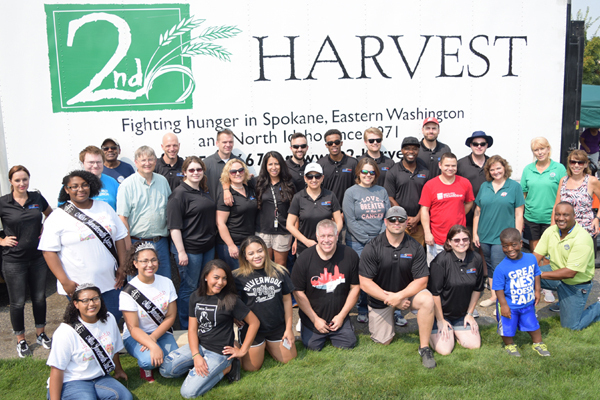 A group of nearly 30 Vit Plant employees helped serve members of the community during the Second Harvest Tri-Cities Mobile Market in Kennewick. The Mobile Market provides free produce, frozen and perishable products, and other groceries not otherwise available at local food banks to area families in need of food assistance. The Vit Plant team helped provide more than 11,000 pounds of food to nearly 900 people. 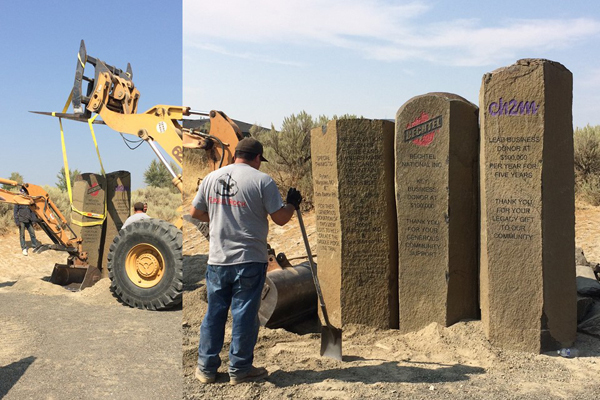 A basalt column is in place at the Candy Mountain trailhead commemorating Bechtel's $100,000 donation to the Friends of Badger Mountain to help create a preserve on Candy Mountain in Richland. 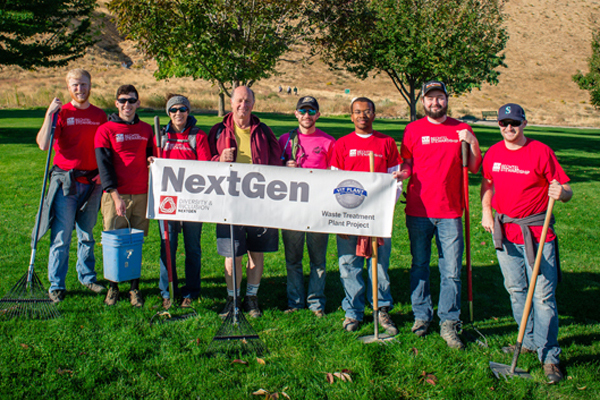 Bechtel is proud of its support to the trail system and quality of life in the Tri-Cities. 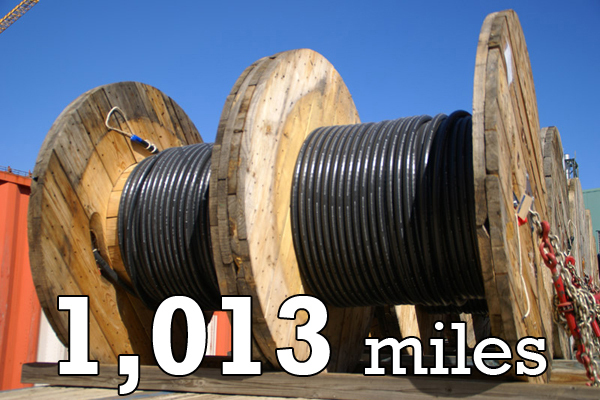 The Vit Plant requires 5,351,000 feet of cable. If laid end-to-end, it would stretch 1,013 miles, more than the distance from Seattle, Washington, to Salt Lake City, Utah. 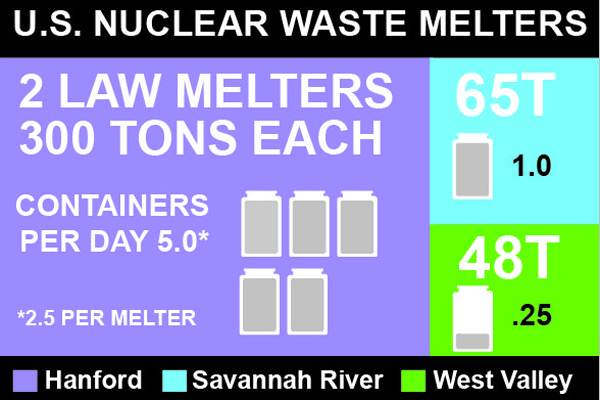 During operations, the Low-Activity Waste (LAW) Facility’s two melters will produce 30 tons of glass daily, ten times the capacity of the vitrification melter in operation at the Department of Energy Savannah River Site's Defense Waste Processing Facility in South Carolina. 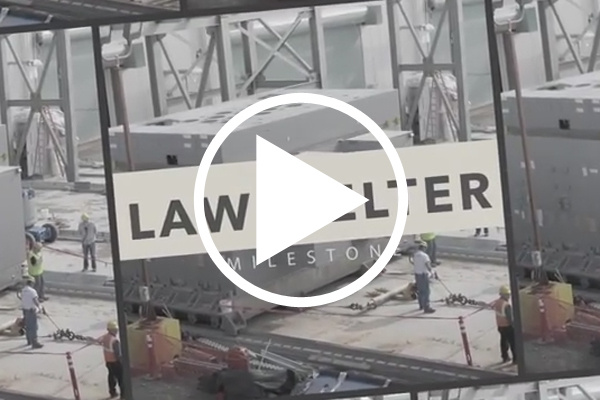 Watch a video highlighting the significant milestone of completing assembly of the two 300-ton melters in the Low-Activity Waste (LAW) Facility. Copyright © October 2017 Bechtel National, Inc., All rights reserved.